It’s hard to say how much of my progress in triathlon is due to getting fitter and how much is due to suffering more deeply. More than once last season, I crossed the finish line after what felt like an honest, hard effort only to find the athlete in front of me in rougher shape. More than once, I felt as if I was out-suffered rather than outclassed in fitness. My ability to dig really deep, to “go to the well”, was underdeveloped. If I’m honest with myself, it was only at my pro debut last season, Texas 70.3, that I truly left it all out on the course. I think I was scared to do it again. Beyond the obvious physical pain of racing at your limit, the emotional investment makes you vulnerable. What if your very best isn’t good enough? Developing the ability to push myself to failure was a theme during my “extended off-season”. After seven solid months invested in training, I was eager for another opportunity to put myself on the line at IRONMAN 70.3 New Orleans against my strongest competition yet. I fell just short of my podium goal, but beyond the result, it was satisfying to venture to the ragged edge of my abilities once again. Wow, I felt starstruck at #IM703NOLA mixing it up with some big names! Thrilled to race again after 7 months invested in training. 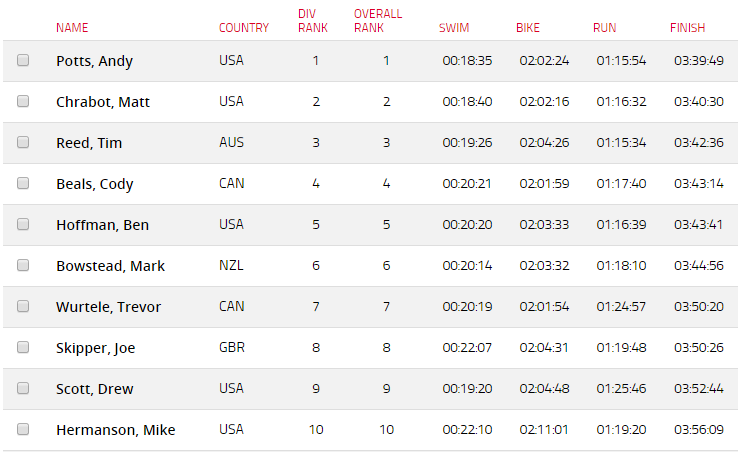 Here are the top 10 (full results). 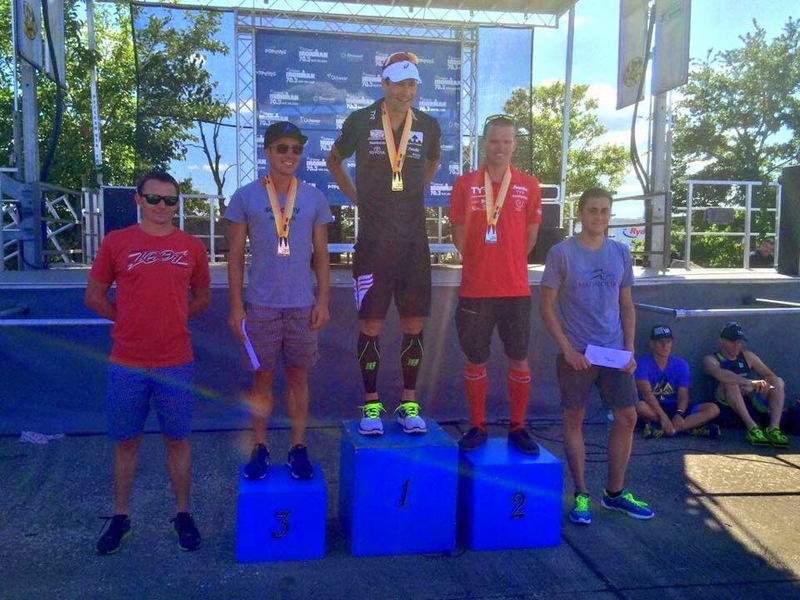 Read on to find out how my race played out. After a long winter on my CompuTrainer and treadmill, I flew down to The Woodlands, Texas at the end of March to put the finishing touches on my race prep. I came down with some lingering bug that sapped my energy for a couple weeks, but forced me to take some much-needed rest. My swimming has been on a roll since attending the Magnolia Masters Pro Swim Camp in January. I hadn’t swum open water since last September, but my swim coach, Tim Floyd, was confident that all my work in the pool would show on race day. I also had confidence in my tried-and-true Nineteen Rogue wetsuit and Vorgee Missile goggles. The swim is too fast and frantic to ever really feel good, but I could tell that it was unfolding differently than past swims. I was able to close gaps and respond to a few decisive surges that would have dropped me last year. I’m finally developing some “gears” in the water. I exited the water in good company with a pack including Ben Hoffman and fellow Canadian Trevor Wurtele, limiting my losses to less than two minutes to Andy Potts (the most dominant swimmer in long course triathlon). Bike – 90 km, 2:01:59, 44.3 km/h! I continued to feel lackluster out on the bike, but I remembered a continual reminder from my coaches: you don’t have to feel good to race well. In fact, just that week, Coach David had sent me a good article by Joanna Zeiger on that very topic. I did my best to ignore how I felt and just execute. Trevor and I bridged up to a pack that included Tim Reed and Drew Scott. This was my first experience in a pro bike pack and the drafting advantage behind several other athletes was astounding, even with the legal 12 meter separation under the watchful eye of an official. I was alternately soft-pedaling, even coasting, then hammering. This was quite unlike the relatively steady state efforts from my races last year, where I was often riding solo. Passing several athletes without illegally slotting in would have required a very costly surge, so I decided to bide my time and wait for the right opportunity. After about 40 km, we turned into a headwind and I decided to attack. Trevor Wurtele was on the same page and we dropped the others. After a quick word as I passed him, we traded leads for the remainder of the ride, working to close the gap to Andy Potts and Matt Chrabot up the road. I used to glue my eyes to my average power and try to push the number as high as I could without blowing up. As I compete at a higher level, my race plans now have less to do with specific numbers than with responses to various “what if” scenarios. The higher your fitness, the more tactical options are at your disposal. I fell well short of my target power, but I rode efficiently by exploiting legal “drafting” opportunities, burning my matches carefully and staying very aero. The conditions were certainly fast, but my new bike setup and position are evidently super slippery. Based on the power-speed relationship I saw on my training test rides and some modeling with Best Bike Split, riding sub-2:02 (44.3 km/h) on this course did not come as a surprise. 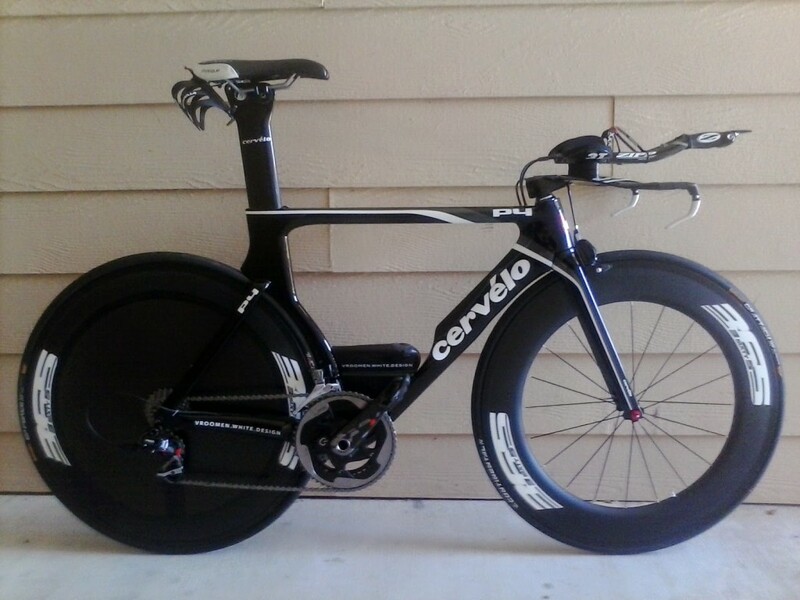 My “P5 killer”, a Cervelo P4 (54 cm) with 3SIXTY5 FAT 88 carbon clinchers, a Catalyst wheel cover, a 3T Ventus I aerobar, a TriRig Omega front brake and lots of other watt-saving details. The code “cody-2015” will save you $50 on any 3SIXTY5 FAT series wheelset and “CODY2015” will save you 10% on a Catalyst wheel cover. 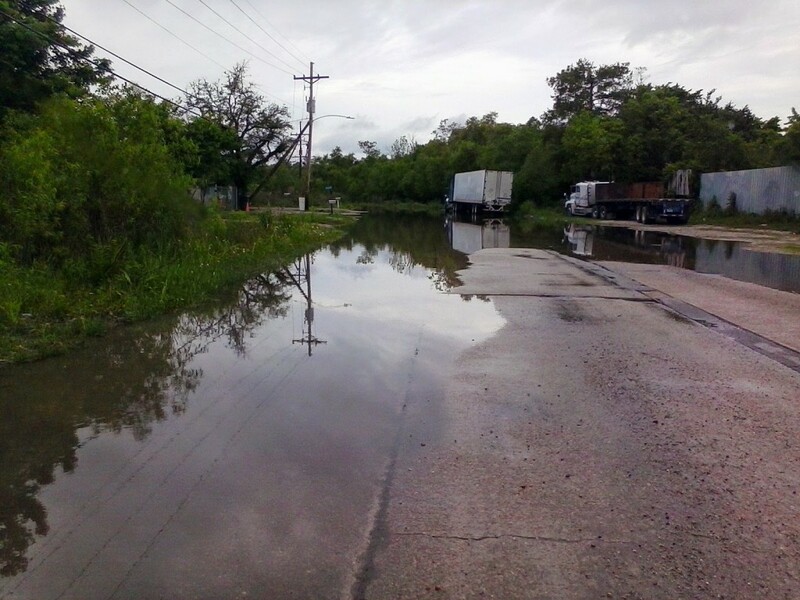 The NOLA 70.3 run course is mostly flat and should be fast… at least on paper. Looking at past results, I couldn’t figure out why everyone seemed to run several minutes slower than usual most years. I was about to get acquainted with the heat and humidity of Southern Louisiana! More than a few pros would have a “right shocker” of a run (in Joe’s words). The downward trend in how I was feeling continued onto the run. I can usually bank on feeling half decent at first, but I was miserable straight out of transition. I tried not to dwell on that, remain objective and remember my coaches’ advice. Despite “feeling” really crappy, I passed Wurtele and appeared to be gaining on Potts and Chrabot up the road. In fact, I was surprised to find out after that I apparently ran the quickest opening 5k (17:23). Lesson: your subjective perception can be misleading. I never cease to be amazed by the repertoire of dirty tricks your mind and body will play to persuade you to slow down, to stop, to give up. The back half of the run would have been lonely if my inner dialogue hadn’t been deafening. I slipped into fourth when Tim Reed made a decisive pass. I knew that Ben Hoffman was also chasing hard. By the last mile, I was almost beyond caring, but my legs still picked up the pace enough to hang on to fourth. At the finish, I plunged into a kiddie pool full of ice water and then got my first IV. The overwhelming feeling was relief—relief that the race was over, but also a deeper sense of relief that I could race at my limit, relief that I hadn’t wasted the past seven months, relief that my objective to compete at the highest level of the sport isn’t a fool’s errand. 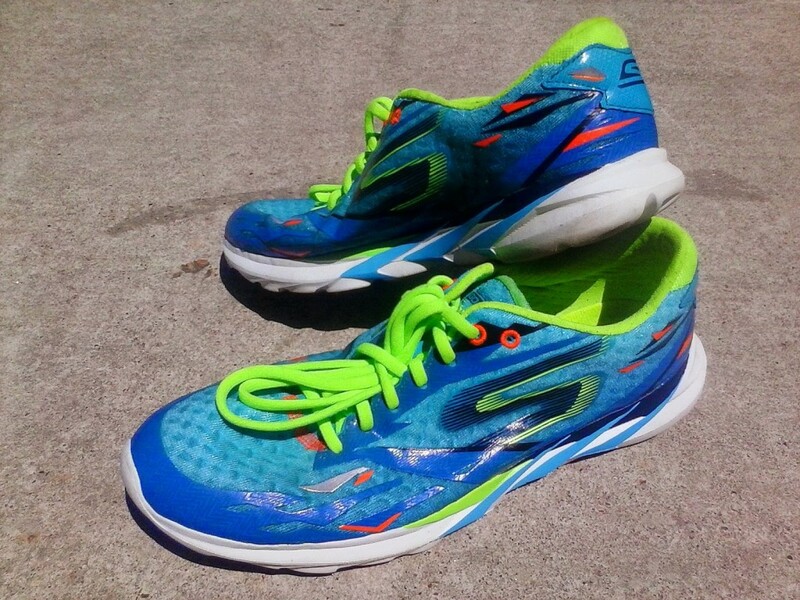 Sock-free comfort in my Skechers GOmeb Speed 3. Elastic laces are included for triathletes. The Amedee family who hosted Joe Skipper and me in fine style for the weekend. They even invited us to their crawfish boil after the race, an authentic New Orleans experience I highly recommend.The Amedee family who hosted Joe Skipper and me in fine style for the weekend. 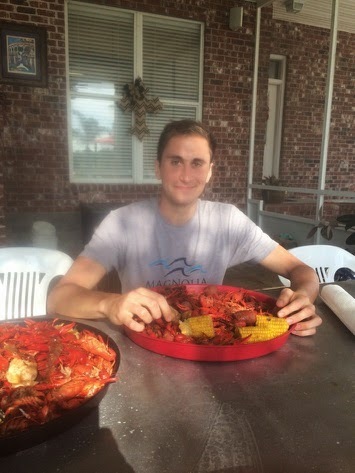 They even invited us to their crawfish boil after the race, an authentic New Orleans experience I highly recommend. Balazs Csoke and Natashia Yezak for hosting me in Texas. My coaches David Tilbury-Davis (PhysFarm) and Tim Floyd (Magnolia Masters). I have one week to recover before taking another shot at the podium this weekend at Texas 70.3!